This lovely dining set was built with outdoor entertaining in mind. This set features 2 swivel chairs, 4 fixed leg chairs, and a table. Each chair comes with a wide, plush seat cushion made with premium foam stuffing and Sunbrella fabric ensuring vivid, lasting color and maximum comfort for seasons to come. The table and backs of the chairs feature a clean, versatile diamond pattern, which will easily go along with any style backyard, patio, or pool area. The table is rectangularly shaped and can comfortably seat 6 people with room to spare! The table was built with a convenient umbrella hole in the table top and support beam underneath, ensuring that if you put up an umbrella it will stay securely in place. Built from aluminum this dining set is rust-free, making it a great choice for those who leave their dining sets out over the winter months. Ruby 7-Piece Patio Dining Set This lovely dining set was built with outdoor entertaining in mind. This set features 2 swivel chairs, 4 fixed leg chairs, and a table. Each chair comes with a wide, plush seat cushion made with premium foam stuffing and Sunbrella fabric ensuring vivid, lasting color and maximum comfort for seasons to come. The table and backs of the chairs feature a clean, versatile diamond pattern, which will easily go along with any style backyard, patio, or pool area. The table is rectangularly shaped and can comfortably seat 6 people with room to spare! The table was built with a convenient umbrella hole in the table top and support beam underneath, ensuring that if you put up an umbrella it will stay securely in place. Built from aluminum this dining set is rust-free, making it a great choice for those who leave their dining sets out over the winter months. 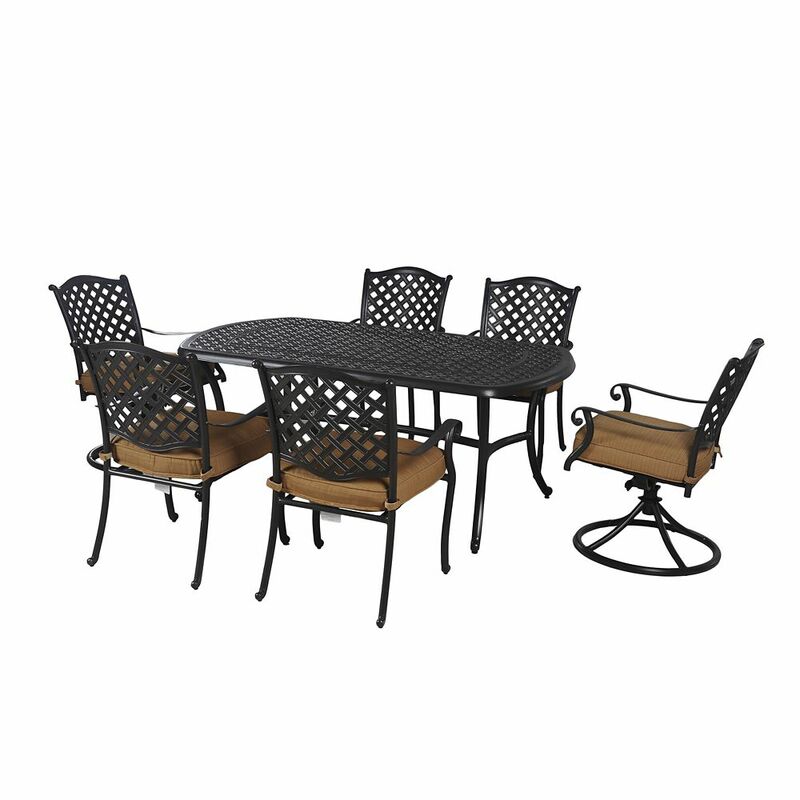 Ruby 7-Piece Patio Dining Set is rated 3.9 out of 5 by 7. Rated 1 out of 5 by Broken from The set I received was used and one of the chairs was broken. I returned it. The set I received was used and one of the chairs was broken. I returned it. Rated 5 out of 5 by Sarah from I am very pleased with my Sunjoy Ruby Aluminum patio... I am very pleased with my Sunjoy Ruby Aluminum patio dining set. The quality is great and it’s really beautiful. It’s a great dining set for the price. The Sunbrella cushions are very nice as well. I highly recommend this patio set. Rated 5 out of 5 by Shannann from VERY nice set for the money!! This set was easy to assemble. It is very sturdy, even though it is aluminum. It is very comfortable & looks great! Rated 5 out of 5 by DavidK from VERY PLEASED - PERFECT....!!! VERY HIGH END LOOKING - GREAT VALUE. We love everything about it. The style - the quality - so sturdy - won't blow over in wind. And the awesome cushions - very thick and comfortable - and great neutral tan/gold color. Came well packaged - and a snap to assemble. Would recommend a partner to assemble to speed it up. For the money - it's definitely a great deal. Rated 1 out of 5 by Annoyed from It's actually brown I ordered this in black as the website specifies but company confirmed that it is actually brown. I ordered and then returned once I saw that it was bronze and reordered in black and it came in this awful brown color. When I originally ordered there were two options bronze or black. I don't understand why no one can correct this on the website. This is not my first bad experience with Home Depot but it will certainly be my last time shopping here. Rated 5 out of 5 by Jima from Ruby 7 piece set it HOT The table is very sturdy. The chairs are comfortable. Priced/value seemed fair. Are the non swivel chairs stackable? Hi Sophie, thank you for asking this question. No, it is not stackable. If you have more questions please feel free to contact our customer service hotline 1-866-578-6569 or visit us at www.sunjoyonline.com. Does the chair seat also have the &nbsp;aluminum design so you can use them without the cushions or do you have to use the cushions?